Seven bidding nations for six European Championship events have been confirmed by the EHF Executive. Seven bidding nations for six European Championship events were confirmed by the EHF Executive Committee at their meeting in London, England on Saturday 24 September 2011. EHF EURO events are the biggest and most important events in European handball and they mean a big challenge and undertaking by both the EHF and the local organiser/host federation. To host such an event is a great chance for national federations to centre the focus of the handball world on their country and at the same time to create an infrastructure to ensure a long lasting positive development. The EHF and the local organiser host federation join together to create and shape a high profile, entertaining and professional elite sports tournament. After the EHF EUROs 2016 and the 2014/2015 YAC EURO Championships for Men 18, Men 20, Women 17 and Women 19 were announced on 17 March 2011, the EHF is in receipt of the bidding documents of the EHF EUROs 2016 as well as the 2014/2015 YAC events. All applications from in total seven nations were approved of by the EHF Executive Committee. As a next step the fulfilment of the necessary criteria will be checked and the bidding nations will be requested to complete and respectively adapt their bidding documents if necessary. Regarding the bids for the organisation of the EHF EUROs 2016 and the YAC European Championships in 2014 and 2015 the below mentioned time schedule applies. As a next step all bidding documents will be analysed and completions, changes or adoptions will be requested. Parallel site visits of all venues which are not known to the EHF from former bids will be scheduled for the period October to December 2011. In March/April 2012, all bids for the EHF EUROs in 2016 and the YAC Events in 2014 and 2015 will be checked by the EHF Executive with regard to the EHF Congress presentation. 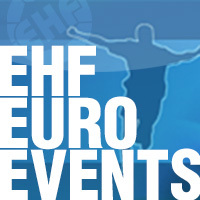 On 23 June 2012, the events will be awarded at the EHF Congress 2012. Based on the additional input and the outcome of the site visits a final evaluation and completion of the bids will take place by February/March 2012.